Developed and published by Midboss. Available on PC (reviewed), Linux, and Mac. Evolution. It's the process by which living things develop and diversify, adapting to our environment, and transitioning from simple to more complex and refined forms. While Natural Selection guided our evolution for millions of years, modern day human evolution is guided by our own knowledge. Advances in medicine and genetics allow us to tinker with the very building blocks that make us human, and research in cybernetics, robotics, and artificial A.I. may one day allow our existences to become wholly digital. These are more than just cool ideas, they are issues that, in the next couple decades, may have a very real impact on our lives. Read Only Memories, a recently released point and click adventure by Midboss, seeks to put you face to face with these issues while also attempting to be an evolution of its own growing genre. It's a few days before Christmas in the year 2064, a world where tensions between a human purity movement, genetic hybrids, and augmented cyborgs are on the rise.. You play an unnamed freelance web journalist who lives in a broken down studio apartment in Neo-San Francisco, and gets paid pennies to write tech and game reviews. Your life changes when one night, a robot sneaks into your apartment asking for help. They introduce themselves as Turing, the first sapient machine, a robot that can think like a human, and they were designed by your old friend Hayden. Unfortunately, someone broke into Hayden's apartment and now Hayden has gone missing. It's up to you and Turing to figure out where Hayden has gone and why he was attacked. Calling Read Only Memories a point and click adventure is only partially correct. On the surface it does look like an old Sierra game, but its systems run a little deeper. 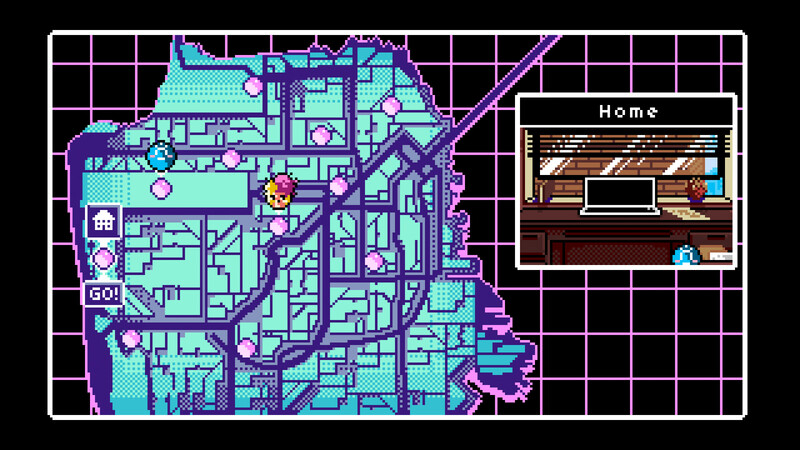 In practice, it's more like a Telltale game, Phoenix Wright, and Snatcher had some sort of millennial cyberpunk baby. However, the way the game handles its puzzles and inventory feels far more Telltale than Phoenix Wright. Your inventory is small, never letting you hang on to more than a few items at a time. You can't even use items on most objects; rather, an object will prompt you if an item needs to be used on it. At this point, you're only showed a few items from your inventory, making it hard to choose the wrong one. The game is streamlined, so that puzzles never get in your way, and you rarely find yourself having to rub every item on every object to move forward. You always have a clear idea of where you have to go and what you have to do next, and this allows the game to primarily focus on dialogue. And boy does this game focus on dialogue. There is a mountain of text to get through here. The game is six chapters long and my playthrough took nine hours, and most of those hours were spent reading. That's not to say that's all you'll be doing. As you can expect, you'll also have to respond to characters, and your choices matter a lot here. An incorrect answer can be the difference between making an ally and following a lead, or running straight into a brick wall and getting half the city on the lookout for you. In fact, the points where you have to interact with other characters are the high points of the game, because the character writing is so good. The cast is incredibly diverse, and not just aesthetically. You'll converse with characters of all different genders, races, careers, religions, political ties, sexualities, ages, cultures, levels of cybernetic augmentation, biological hybridizations, and personalities. Some are good people, some are assholes, and some simply want you to go away so they can drink their latte and pretend they're writing.